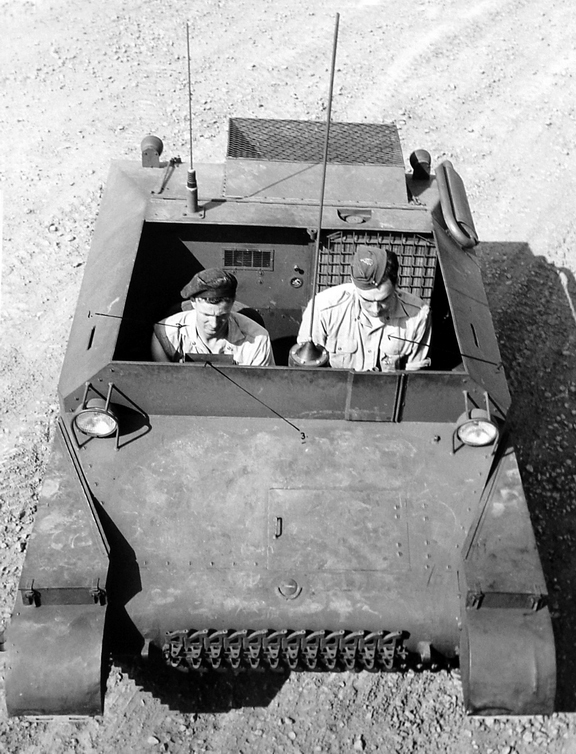 In late 1942, the Canadian Department of National Defence (DND)’s Directorate of Vehicles and Artillery (DVA) began work at No.1 Proving Ground in Ottawa on a small tracked vehicle using largely Jeep automotive components. 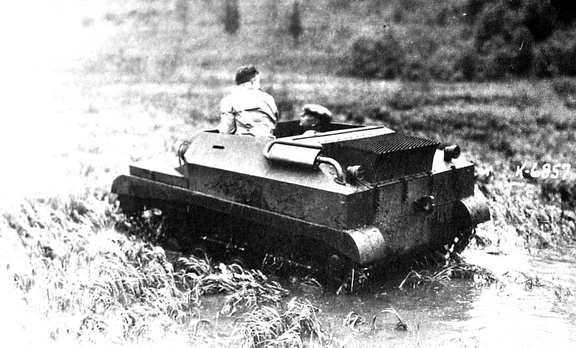 DVA anticipated that there was a potential requirement for the smallest practicable tracked vehicle, for use by airborne troops and in the Pacific theatre. The project was formalized by the Army Technical Development Board (ATDB), on 10 January, 1943, as project 49, and assigned to its proponent DVA. The vehicle came to be referred to successively as: the Bantam Armoured Tracked Vehicle, the Light Recce Tank, and finally as the Tracked Jeep. Its envisaged roles included: intercommunication (running messages over contested ground), armoured reconnaissance, and engaging unarmoured troops in airborne and combined operations. Follow-on versions of the vehicle were to be amphibious, with twin propellers for water propulsion; although fully laden, it had a very low freeboard. The pilot was demonstrated in Ottawa in May, 1943. On 7 June, it was decided that further development of the vehicle would have to take place in the USA, and that the General Staff Specifications and the pilot Tracked Jeep should be sent to a firm there. The logical choice for this was Willy-Overland in Toledo, The Canadian Department of Munitions and Supply (DM&S)’s Army Engineering Design Branch (AEDB) gave Willys a contract to construct five prototypes, working under DVA’s supervision. Willys would provide the power train components, while Marmon-Harrington was contracted to provide the running gear, and body and do the final assembly. On 8 July the pilot was sent to Toledo. En route, on 10 July, it was demonstrated at US Ordnance’s Aberdeen Proving Grounds, in Maryland. There, despite its rather makeshift nature, pilot Tracked Jeep performed quite well. 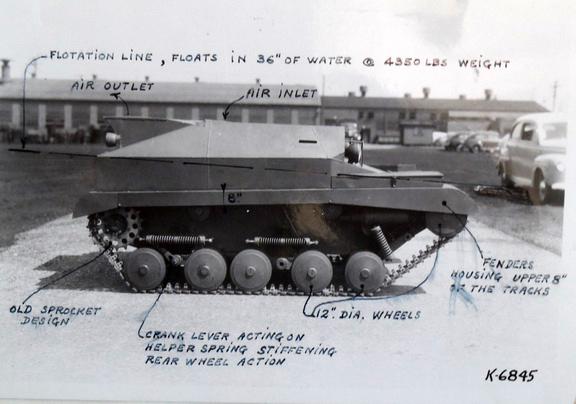 Initially it evoked little interest among the allies (although DVA suspected that US Ordnance was inspired by the Aberdeen demonstration to begin development of its rival T-29 amphibious light tracked vehicle – also based on jeep components). The specifications and film footage of the Tracked Jeep’s trials was sent Canadian Military Head Quarters (CMHQ) in London, however the Commander of First Canadian Army Lt. General Andrew McNaughton could see no requirement for such a vehicle. More enthusiastic was Major-General “Tubby” Lethbridge, whose 220 Military Mission was visiting North America investigating looking into weapons and equipment for use in South-east Asia. He was shown the pilot and expressed his belief that the Tracked Jeep would be “of special value for jungle warfare” On 27 August, Lethbridge ordered five production models requesting that three be assigned to the UK, and one each to India and Australia for trials. Arrangements for this were complicated by the fact that the actual vehicles were being made in the USA. Canadian Mutual Aid (Canadian’s programme of military assistance to Britain and other allies) could not make purchases in US funds, while Lend-Lease only covered equipment that was in production for the USA. The problem was finally solved in April 1944, by buying the vehicles on the Canada Account, and giving them to the UK as a gift. 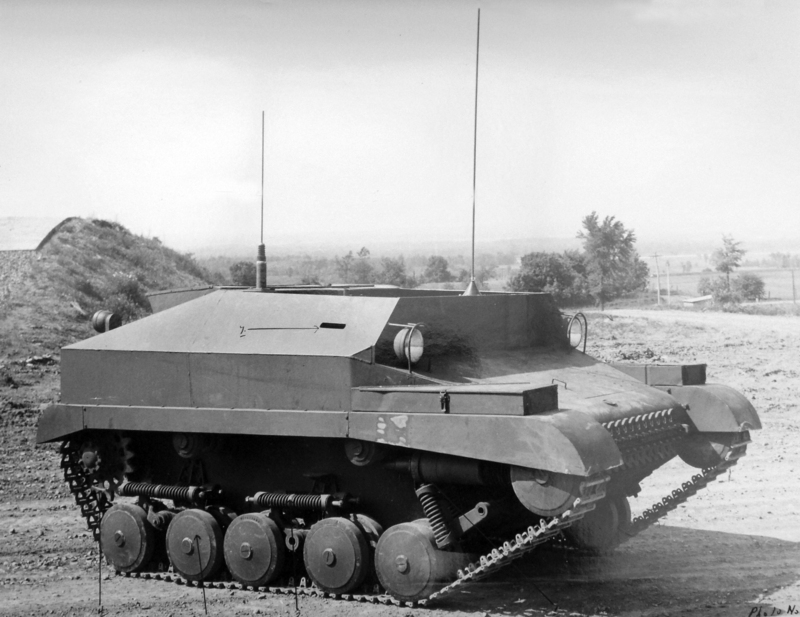 The pilot was lightly armoured, open-topped (the British wanted it have roof armour, DND did not consider this to be feasible, but did agree to increase the floor armour to 6 mm for added mine protection), front-engined tracked vehicle with a crew of two, It was armed with a Bren LMG, while a No.19 radio-set (the standard set used in Commonwealth AFVs) was fitted under the dash on the left side. Unlike the front-engined pilot, the prototypes produced at the Willys plant, in Toledo, Ohio, mounted the engine transversely at the rear, to reduce the vehicle’s length. A Hotchkiss-type suspension was used, with two sprung bogies, each with two double road wheels, and a sprung leading wheel on each side. To ensure good riding characteristics, the suspension was moved as far back as possible while the idler was at the front. The tracks were designed to have extremely good adhesion in soft mud, and the Tracked Jeep could climb a gradient of 40% (it was claimed that 70% was possible, if the vehicle were properly balanced) . A standard Willys engine was used but with a Carmazin radiator which was the same size as but gave better performance than the Willys desert radiator. Steering was by controlled differential. Because its airborne role would make front-line maintenance difficult, the Tracked Jeep was intended to be able to go 2,000 miles (3,200 km.) with minimum repair or maintenance. The suspension was designed to run without lubrication. This need for low maintenance had to be balanced by the need to keep weight as low as possible. The solution was to design modular components, such as the drive train, or suspension units, which could be quickly replaced in their entirety. Willys’ first prototype was completed in April 1944. It suffered some initial teething problems, including a propensity to shed its tracks. These were partially solved by increasing the road wheel diameter from 10 to 12 inches (25 cm to 30 cm). Once the pilot seemed to work satisfactorily, it was demonstrated at Toledo, Ohio on 23 May, 1944, to representatives of the Canadian Army and Department of Munitions and Supply and soon after to representatives of the British Army Staff; the US General Staff and US Ordnance. All were all duly impressed by its performance. 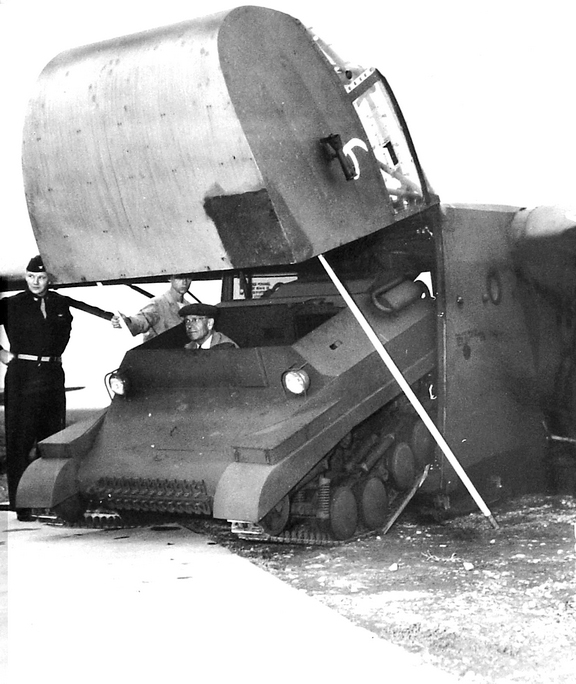 At Lethbridge’s urging the pilot was dispatched to the UK on 7 July, 1944 after only a brief period of testing in Ottawa, to determine what modifications were required to make the Tracked Jeep fully amphibious. Unfortunately, Lethbridge was out of the country at the time the Tracked Jeep arrived in the UK, and CMHQ could find no one else at the War Office who had any particular interest in the project. No one at CMHQ was very enthused by it either. CMHQ had assumed the Tracked Jeep was just that – a light tracked load-carrier. 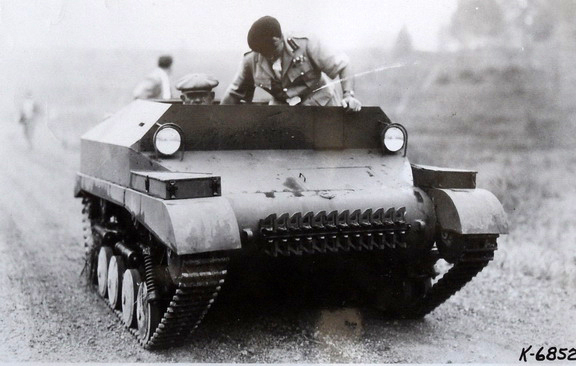 They were dismayed to receive what looked like a reinvention of the pre-war Carden-Loyd “tankette” (Canada’s only armoured vehicle in the 1930s). In September, Lt-General Stuart, CMHQ’s Chief of Staff told DND that CMHQ saw no Canadian General Staff requirement for the Tracked Jeep. When the representatives of the British Ministry of Supply’s finally got around to seeing the vehicle being tested at Bracknell, in late September, they were impressed by its vehicle’s capabilities, but, like CMHQ, could see no requirement for it. On 20 September, DND halted work on the further prototypes until the British could make up their minds on whether they wanted the Tracked Jeep, or not. The Tracked Jeep demonstrated superior cross-country performance over all sorts of terrain, particularly soft mud. Its hill-climbing ability was judged superior to all other light tracked load carriers, while its amphibious capacity was deemed adequate (despite its low freeboard). 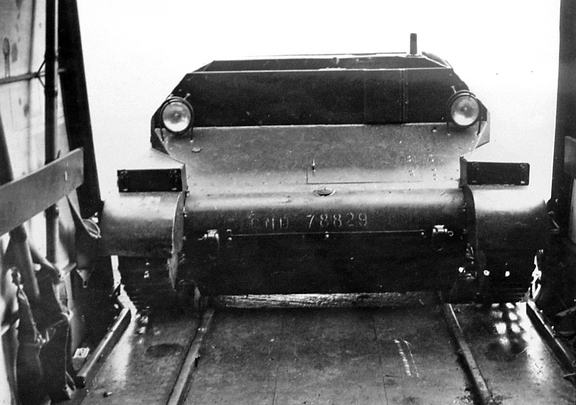 However, despite the intent that it operate with minimal maintenance, early trials in the UK and in Canada quickly revealed serious flaws in the design of the bogies and tracks. New sets were sent out by air, but their redesign delayed the dispatch overseas of pilots 3 to 5 until November 1944. General Lethbridge agreed that prototypes should not be sent to Australia or India until these flaws were ironed out. Trials in the UK and in Canada through the rest of 1944 and into the spring of 1945 showed continued weakness in the tracks, with failures to most of the track-shoes and the pins after 300 to 500 miles (500 to 800 km). There were also major suspension failures. Bogie axle shafts broke, while the bogies themselves wore out after 2,300 miles (3,700 km.) – despite most Canadian trials taking place over relatively benign snow-covered terrain. The transmission also failed after 1,400 miles (2,300 km.). In November 1944, in an effort to address the problems with the Tracked Jeep’s bogies, the ATDB approved Project 910 whose aim was to produce a pilot set of magnesium wheels for the Tracked Jeep. These had synthetic rubber tires, bonded directly to the metal. The wheels were completed and tested in August 1945. The wheels themselves performed well, the tires did not, rapidly shedding in use. 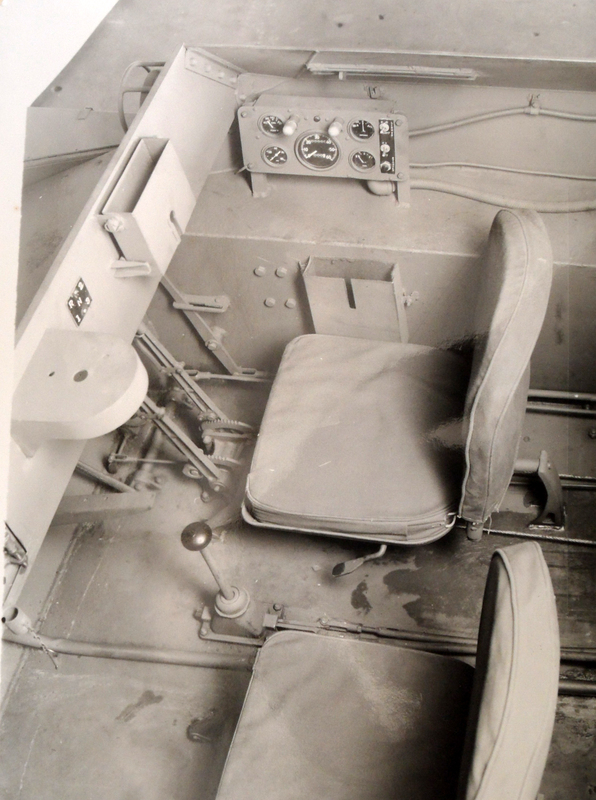 British requirements had meanwhile shifted from a two-man; light-armoured reconnaissance vehicle to an unarmoured (except for mine protection to the floor) air-transportable (able to fit in a C-47 without removing any equipment) load carrier with a front engine. 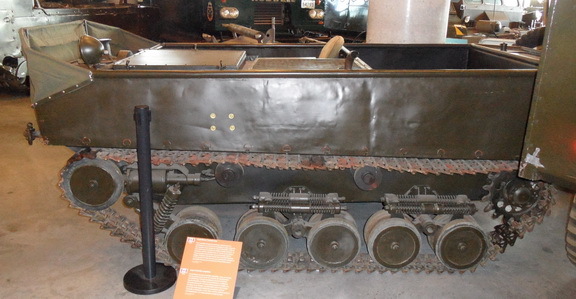 A Tracked Jeep Mk.II was therefore designed, which incorporated the changes made to the Mk.I’s running gear and had a projected load capacity of 3,000 lbs (1,500kg). The six pilots ordered by the British Ministry of Supply were now to be this version. Willys, however, was unable to work on the Mk.II, citing other commitments (building the Tracked Jeep’s American cousin the T-29). 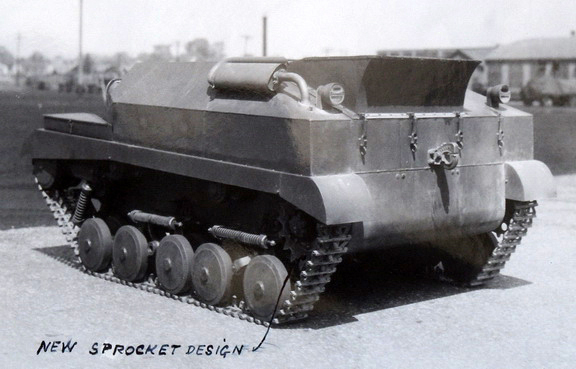 In late November 1944 an offer to construct the Mk.II prototypes for some $170,000 was received from Marmon Harrington. This was still under consideration when, on 29 November the British Ministry of Supply advised CMHQ that it was no longer interested in the Tracked Jeep and suggested Canada should “investigate other types of airborne AFVs for future development”. The requirement for the load carrying version was “now defunct”. 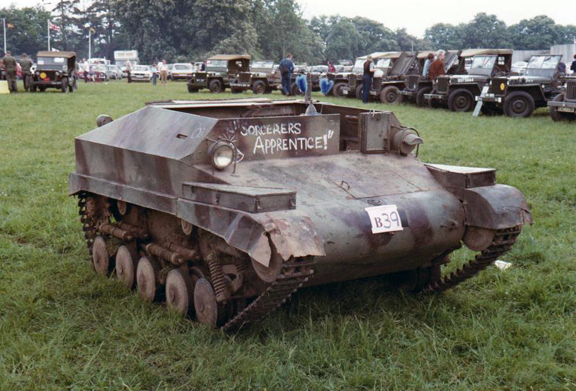 The Ministry of Supply was even less enthused by the armoured version of the Tracked Jeep, suggesting that three prototypes be sent to Australia, New Zealand and India to see if they had any use for them. CMHQ observed to Ottawa, on 4 December, that the Tracked Jeep Mk.I had great performance, but no one could find a practical use for it. As for the Mk.II, because they were being built in the USA, the British had doubts about Canada’s ability to effect their delivery in sufficient quantities before the War ended. 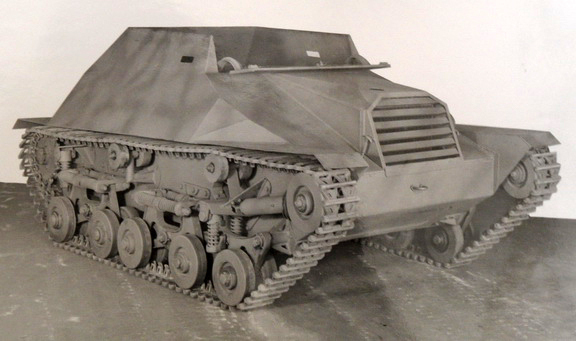 Questions were raised about how the Tracked Jeep’s role differed from the “jungelized” version of the Canadian Armoured Snowmobile, which were also being developed by the ATDB, to meet another British requirement. Moreover, no solution had been found to the financial complication that, because it not being standard US equipment, it was not eligible for Lend-lease. 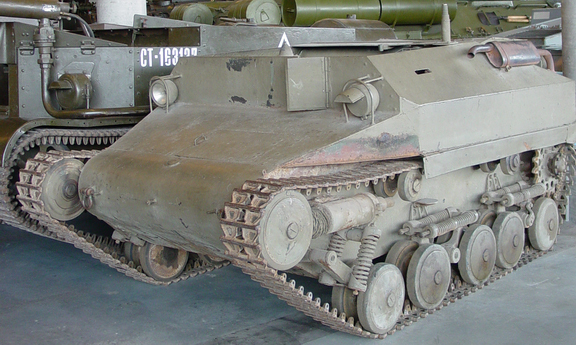 The British were therefore more interested in US-made light amphibians such as the T-29 or the Weasel. In its response, DND argued that production of the Tracked Jeep Mk.II in Canada should present no problems and poured scorn on the capabilities of the Weasel and the T-29. The War Office did not, in fact, agree with the Ministry of Supply, and on 5 December, 1944, asked Canada to give top priority to developing the cargo version, and confirmed the order for six Mk.II prototypes. The contract to build them was concluded with Marmon-Harrington in early January 1945. Labour problems at the Marmon-Harrington plant, however, delayed their completion and the first prototype was only ready in July 1945 – justifying the Ministry of Supply’s concerns. In March 1945, CMHQ suggested sending two Mk.I prototypes to First Canadian Army for field trials. First Canadian Army was initially interested, but by late April, it was clear that any requirement for them had evaporated. Given the obvious fragility of the equipment, it seems just as well that these trials did not happen. Pilot No.5 was used for air-transportability tests in the USA. With some shoe-horning (including removing the idlers), it was loaded into a C-47, and into CG-13A and CG-15A Gliders. The conclusion was that, in its present form, the Tracked Jeep Mk.I was not suitable for airborne use. With the end of the War – and of any further need for jungelized equipment – a new role was needed for the Tracked Jeep. Not required by the War Office, the last Mk.II pilots were delivered by Marmon Harrington to No.1 Proving Ground in Ottawa. In the spring of 1946, one was sent up to Churchill, in Northern Manitoba to be tested in swampy sub-arctic conditions alongside the Muskrat and Mudcat (amphibious versions of the Armoured Snowmobile). Again the weaknesses of the running gear proved evident, and, by October, DVA was reporting excessive wear on the tracks. The project was deemed a long term one (i.e., to be continued eventually) when the ATDB was disbanded at the end of 1946. Surviving examples of both the Tracked Jeep Mk.I and Mk.II now reside in the Canadian War Museum, costly memorials to what seemed a good idea at the time. You can rate this article by clicking on the stars below. Great article of a little known project.